I am still recovering from the fun I had watching Captain America: Civil War last week. While not my favorite Marvel or even Captain America flick (see Winter Soldier), the movie was just a lot of fun. Dean summed things up nicely in his review, but I would have added a bonus point for Vision's sweater and docked a point for being about 20 minutes too long. I hope you all had a successful Free Comic Book Day and are back in the swing picking up your pull lists. Southern Bastards #14 - The new arc to Southern Bastards is a doozy. Turns out Earl Tubbs has a daughter who wants to get to the bottom of his death. She just returned from serving in Afghanistan and doesn't pull any punches trying to reclaim what was taken from her father, but is up against a lot of racist opposition. Jason Aaron doesn't hold back in addressing the race relations in Alabama, and at many times in this issue I felt uncomfortable. That is meant as a compliment as witnessing discrimination, from the perspective of the individual facing it, is a powerful thing. Entitled "Homecoming", this looks like it may be the best arc in what has been a fantastic series. I cannot recommend this enough. Aaron is brilliant in capturing the racial undertone in this small town, and Jason Latour does a phenomenal job portraying Roberta's struggle as she tries to understand why her father died. Batman: Teenage Mutant Ninja Turtles #6 - This surprising series reached its conclusion this week, and while it isn't the strongest finish I've read, it was fitting. The big surprise last time was that Shredder introduced the mutagen to Gotham's greatest villains. Mr. Freeze as a polar bear had to be my favorite twist, but the payoff in this issue was a bit of a let down as things had to wind up quickly. I think extending this to one more issue would have really helped things out. Overall a great mini-series, but it ultimately felt like a rushed ending and what could have been an amazing payoff was a bit underwhelming. Batman #52 - The torch has officially been passed. No stranger to Batman, and author of the crossover with the Ninja Turtles, James Tynion IV has earned the right to pen the main Batman storyline. In a quasi-origin story, we learn how motivated Bruce Wayne is to be the best Batman he can be. It also was a touching story the further demonstrated how strong the bond is between Wayne and Alfred. While the story wasn't anything ground breaking, it sets the scene effectively for "Rebirth" and demonstrates that Batman is still in good hands. 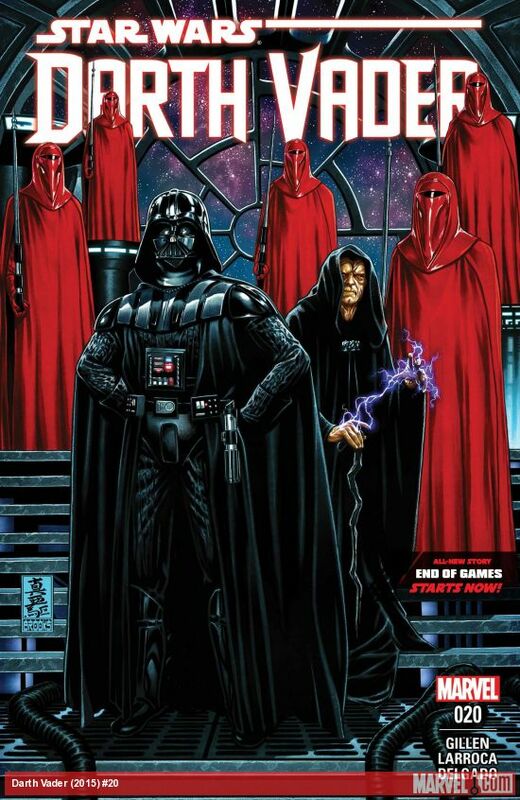 Darth Vader #20 - While I continue to enjoy this series, it is starting slow down significantly. In a very anticlimactic issue, Vader has a pow wow with the Emperor on a Super Star Destroyer that is quite ridiculous looking. The takeaway from the performance review is that Vader, due to the fact that he kills anyone that gets in his way, is the savior of the Sith. Still trying to track down Aphra to hide what happened I don't know how many issues ago, it looks like the two will finally be reunited. I get that political maneuvering is always going to be part of this universe, but it is the part that I like the least. I sure hope that things pick up soon as this has been my favorite of the new Star Wars titles at Marvel. The Fix #2 - This comical series about corrupt cops from Nick Spencer, Steve Lieber, Ryan Hill, and Nic J. Shaw improved upon its solid first issue. After their failed attempt at a heist of a retirement home, the two inept detectives hatch a plan that involves Roy shooting his partner in the hand. Mix in Roy trying to frame a co-worker for a murder I am guessing he committed and you have a very surreal, bizarre, and entertaining series. I am still not sure where the overall story is going, but I know that reading about the antics of Roy and Mac is highly entertaining and I look forward to really getting to know the cast of characters that are involved. There is an air of mystery similar to Morning Glories, but not in an evil school way.